LEWISTON — It's easy to call them siblings, even though this was the first time most of them had met face to face. They sure acted like siblings: Silvia Rezzonico, 25, of Milan, Italy; Estefany Saldivar Garcia, 22, of Monterey, Mexico; Anne Borra, 18, of Utrecht, Netherlands; and Uyen Ha, 20, of Vietnam hugged, joked and teased like they'd grown up together. "We share something equal," said Tom Hage, 35, of Amsterdam, the eldest of the five. "We share the Reeds and the experience. It's funny." Scott and Judy Reed and their daughter, Leslie, are family to these exchange students who spent their senior years as Lewiston High School Blue Devils. They share a family, a Lewiston home and year of life at Lewiston High — even though it was a different year for each. Call them serial siblings, separated by time and distance, but with some important things in common. "I know that any time I want, I can come here," Rezzonico said. "And I will always have a second family here. I tell Judy stuff that my Mom doesn't even know about." Five of the Reeds' seven exchange students — representing 18 years of their life together — came back to Lewiston on Saturday to help the couple celebrate their silver anniversary. "I didn't need to be convinced," Rezzonico said. "Judy just told me about it." The couple recommitted to their marriage vows in a Saturday night ceremony at the Hilton Garden Inn in Auburn. Judy said she'd planned one part of the ceremony with the kids in mind, and it involved many varieties and colors of sand. She and Scott would start, pouring their sand in a jar. Next, Leslie would pour her vial of sand on top. Then each exchange student would be introduced, say a few words and pour sand in the jar. "By the time it gets done, it will represent our 25 years together," Judy said. The couple married on March 26, 1988, at the Bates College Chapel. Leslie was born in 1994, and the family decided to investigate hosting an exchange student. "I called to ask what was involved, and they said we could do the home inspection and have one come stay with us in a few days," Judy said. "We just wanted to know about the program and a week later, Tom was here." That was in 1995, when Hage was scheduled to come to the U.S. His host family in Pennsylvania had backed out three days before the trip. That would have left him effectively homeless. "They ran out on me, and decided not to have an exchange student," Hage said. "I don't know why. So I had to wait for another family, and I ended up going to Maine." It was a good experience, he said. "I mean, you spend 10 months in a house with people, and it's an important 10 months," Hage said. "The people you stay with matter. So for me, it was a decisive year." It showed Scott and Judy that they didn't have enough room in their Pearl Street house to host an exchange student. When they moved to a larger house on Webster Street six years later, she knew it was time to start again. "As soon as we found it, it was like, 'Good; we're going to have a spare room'," Judy said. "We knew we could have another student." Steffi came from Germany in 2001. She was followed by Rezzonico in 2003, Jiyeon Jeon from South Korea in 2005, Saldivar Garcia in 2007 and Borra in 2008. Ha was the most recent of the group, coming in 2010. Only the German girl, who died after she had returned home, and South Korea's Jeon didn't make the trip. But they've all come back to visit for summer trips since their initial stay, some even bringing their families to meet their American mom and dad. 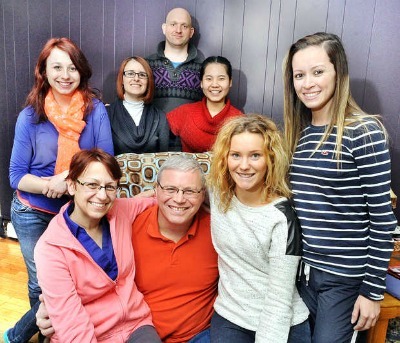 And Scott and Judy have traveled overseas, staying with their exchange kids time and again. "All of the decisions I've made afterwards have been influenced by the fact that I was here." Rezzonico said. "I really think the experience is not just the one year that you spend, but it continues and you keep it for the rest of your life." Leslie, a first-year student at the University of Southern Maine, said it's given her an amazing perspective — and a whole slew of siblings. "It's like I've had a different childhood than everybody else," Leslie said. Judy said she decided last year it was time to get the whole group together, and she and Scott's 25th anniversary seemed the perfect time. Saldivar Garcia joked that she just came for the food — she didn't even know there was anything special going on. She was just hungry. She also joked that she was the favorite — until a year later when Borra showed up. This weekend, the two have argued — good naturedly, of course — about who can claim the bed in their former room. "We get along," Borra said. "We just fight, but that's the fun part of it. We've only known each other for two days." "And it has been the best two days of my life," Saldivar Garcia dead-panned. Judy said the bed would soon be claimed by another. They're planning to host an exchange student, from Norway this time, in the fall. "They become yours," Judy said. "You are responsible for them while they are here and they are going through some changes, so they confide in you. It's an important time, and they are all very special — very different but very special. And I love each one like my own." Read the original article in the Sun Journal here.